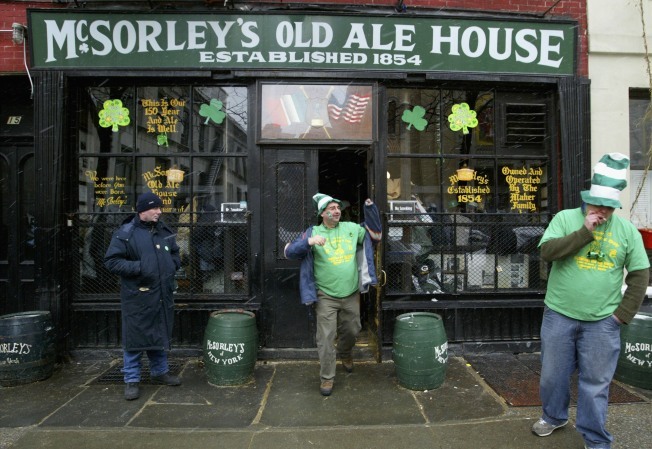 It takes a truly insane person to try and wedge himself into McSorely's on St. Patrick's day. Could it be true? Might there be less green beer flooding the streets this year? This St. Patrick's Day, which is next Tuesday, people might be lacking the green to go green. According to a survey by the National Retail Federation, Americans are planning to spend less on the annual March blowout. So maybe there will be a few less Irish Car Bombs shot back this year. A recent liquor industry campaign supporting moderation, including offering text message reminders to hold back when partying, might be coming at the right time. Still, those that really go Erin with gusto — 25 to 30 years olds — plan to spend nearly $40 on average on the holiday, even though the overall number is down a few dollars. And don't count on New Yorkers to follow the national trend. There is still sure to be no discernible decline in carnage along Fifth Ave. after the 248th annual St. Pat's Day Parade makes its way uptown. New Yorkers are not known for their moderation when it comes to parades, bag pipes and green beer. If the pubs are overrun, and you know they will be, and you're looking for an unlikely, but festive spot to hold court after the parade look no farther than a place more associated with St. Nick than Pat: Rolf's. In characteristic over the top fashion, the German institution puts on a corned beef and cabbage and beer filled extravaganza in a shamrock festooned dining room and bar.